Soft fibromas are the most common fibrous lesions of the skin. Lesions are most commonly located on the neck and the intertriginous areas of the axilla and groin, but can be found scattered throughout the skin. Patients present with slow-growing asymptomatic flesh-colored or brown-red papules/pedunculated polyps, ranging in size from a few millimeters to a few centimeters (Figure 1, Figure 2). Most are asymptomatic. Some (rare) will eventually become associated with irritation or pain secondary to torsion and/or infarction. A diagnosis is usually made clinically. A biopsy commonly demonstrates a polypoidstructure with epidermal papillomatosis and acanthosis. The dermis consists of a collagenous stroma, often filled with dilated blood vessels in the center. Adipocytes can be seen within the core of larger lesions. The clinical differential diagnosis includes dermal or compound melanocytic nevi, seborrheic keratoses (benign brown papules with a stuck-on and verrucous appearance that occur on any body site except palms and soles), solitary neurofibromas (soft compressible 2-20mm pink-white papules and tumors), and molluscum contagiosum. Histologically, the differential diagnosis includes nevus lipomatosus superficialis (soft compressible plaques or grouped papules), angiofibroma (small dome-shaped 1-3mm papules on the face, most frequently the nose), seborrheic keratosis (stuck-on or pasted-on papules and plaques), and molluscum contagiosum (solitary or multiple umbilicated dome-shaped papules, often with a whitish core, found mainly in children). Soft fibromas are very common and found equally in men and women. The lesions are more common in obese patients; they often increase in number and size with advancing age and during pregnancy. Many studies have shown an increased incidence of insulin resistance in patients with multiple skin tags. The cause of soft fibromas is unknown. Friction and irritation have been proposed as etiologic factors. Although histologically distinct from conventional soft fibromas, hamartomatous soft fibromas are found in Birt-Hogg-Dubé syndrome (perifollicular fibromas) and Cowden disease (sclerotic fibromas). It is important to consider these diagnoses in the evaluation of patients with fibromas and other manifestations, since there are systemic and potentially life-threatening associations in Birt-Hogg-Dubé and Cowden disease. Birt-Hogg-Dubé is a rare, autosomal dominant genetic syndrome in which patients often present with fibrofolliculomas, trichodiscomas, and acrochordons in their 20s. Patients are predisposed to develop chromophobe renal carcinoma and renal oncocytomas, as well as pulmonary cysts and spontaneous pneumothoraces. Cowden disease, an autosomal dominant disease, is characterized by trichilemmomas, mucosal papillomas, acral keratoses, sclerotic fibromas, and an increased incidence of malignancies, particularly breast carcinoma and thyroid carcinoma. There is no conclusive evidence that individuals with multiple skin tags have a higher incidence of diabetes or colonic polyps. Skin tags appear to be more common in individuals that are overweight, which may explain the possible association with non-insulin-dependent diabetes. The association with colonic polyps is more controversial. Individuals should follow routine screening guidelines, as established by their primary care physician. If an individual has a family history of colonic cancer and multiple skin tags, it may be reasonable to refer the patient to a gastroenterologist for a discussion about when to perform screening colonoscopies. Simple removal is accomplished with scissor excision, electrodessication, or cryosurgery. Larger skin tags may be removed with excision; this is rarely needed. Most skin tags can be removed without the need for anesthesia. Observation or simple scissor excision removal is recommended. Since acrochordons are benign tumors, removal is generally considered cosmetic unless lesions are symptomatic. If there is a question of diagnosis, biopsy and histopathologic evaluation should be performed. Skin tags in children should prompt the clinician to screen for basal cell nevus syndrome (BCNS). In children, basal cell carcinomas in BCNS have been reported to mimic skin tags. 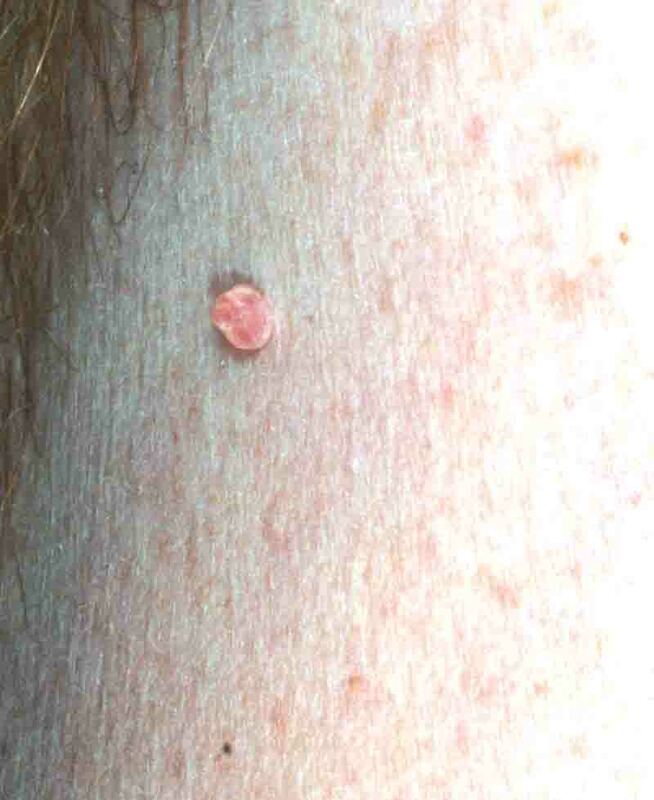 Skin tags may be seen as a part of Birt-Hogg-Dubé and Cowden syndromes. A newborn with a preauricular skin tag should have audiology testing, as this has been reported in association with hearing difficulties. Preauricular tags have also been seen in infantile systemic hyalinosis.